In hindsight, those first half-dozen years spent exploring “primitive hunting,” as I called it then, weren’t very productive in terms of pursuing wild game in a “period-correct” manner. The desire was there, and I put food on the table with the Northwest gun, but I knew little of living history, maintaining an authentic portrayal or achieving the proper mindset that allows one to travel back in time. During those early years, I simply didn’t understand the need for structure, purpose and direction that traditional black powder hunting requires. Yet even then, the challenges, emotions, and exhilarations were unmatched. I bumbled along, trying this or trying that, and when I shared my discoveries with fellow modern hunters their responses were less than favorable—raised eyebrows and snide comments were the norm. I withdrew, hunted alone and said nothing, all the while thinking ‘I must be the only one who gets a kick out of this.’ I had no idea others engaged in traditional style hunts, until I met Roy “Pa” Keeler. In an afternoon, Pa Keeler introduced me to a whole different perspective on black powder hunting. 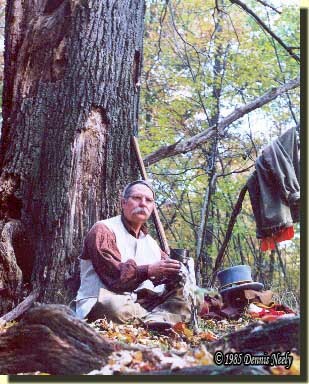 If nothing else, he made me aware that others shared the same passion I did for pursuing “the old ways.” At the time, I didn’t know that Pa Keeler, along with several other local traditional black powder hunters, was instrumental in establishing Michigan’s muzzleloading deer season. My conversations with Roy also pushed me to broaden the scope of my research. He got me to thinking more about what I was attempting to do, in somewhat of an academic way, much like a knowing teacher who prompts a student to delve beyond a given day’s lesson. Little by little, Roy’s quiet suggestions helped me recognize common threads woven into the fabric of each traditional hunt. As I thought about each commonality, crude definitions emerged and those definitions started to add structure to my simple pursuits. At Roy’s urging, I joined the National Muzzle Loading Rifle Association and started reading the association’s publication, Muzzle Blasts. An ad in Muzzle Blasts led me to MUZZLELOADER magazine. Hunting stories or how-to articles by Max Vickery, Ralph Marcum, Sam Fadala, Ronald Jones, Warren Boughton, Tim Todish, Pat Tearney, and so many other fine writers of that era fueled my imagination and drove me deeper into the past. But it was the “Tidings from the 18th Century” letters of Beth Gilgun and Mark Baker’s “A Pilgrim’s Journey” that offered the greatest inspiration. Hidden within their words were the essential tenets necessary for adding the structure, purpose and direction to my wilderness wanderings. Like a young teenager, I began experiencing “living history growth spurts,” followed by periods of introspective tempering and self-evaluation. The “historical me,” my forest persona, began to mature. As a traditional hunter, I progressed from plateau to plateau, much like climbing a ladder’s rungs, except the climb is far from mundane, for you see, each rung harbors a greater challenge and offers a heftier reward. Then one day, my persona stumbled through time’s portal and traveled back to the 18th-cenury’s last decade. The Basics section of this web site contains a series of essays that define specific elements common to most traditional black powder hunts. These definitions and commonalities are not set in stone; rather they represent one individual’s perspective on this joyous living history genre, based on three-plus decades of traditional black powder hunting adventures. These essays are included with the hope of smoothing the trail to yesteryear for a bewildered newcomer or perhaps to spur on a fellow traditional hunter who has frolicked too long on a given plateau.